Recipes, videos, tutorials and entire menus all available in the Cloud. 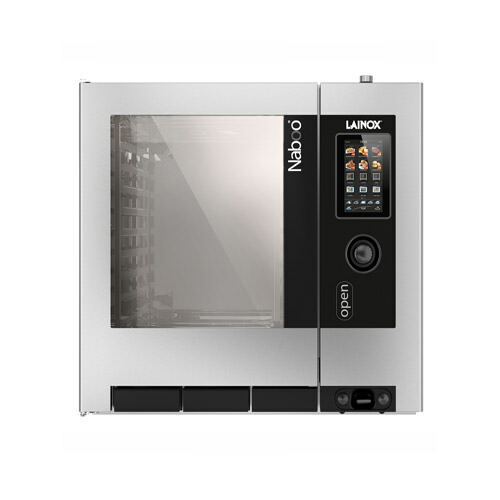 Ecospeed Dynamic - recognizing the quantity and type of product being cooked, Naboo optimizes and controls the delivery of energy and maintains the correct temperature, preventing and fluctuations. Multilevel - cook different foods with different cooking times simultaneously, prevent downtime, partial loads and unnecessary consumption. FAST DRY - chamber humidification system, get perfect crispness and browning of fried foods, grilled foods, desserts and bread. Autoclima - Humidity control system. Juiciness and tenderness are also ensured when warming pre-cooked foods. Smokegrill - First professional oven allows grill cooking that replicates the benefits of cooking with wood. Flavouring - New Aroma Dispenser application available so different types of food with varied types of flavoring can be created. Probe for Every Function - Multipoint probe ensures perfect cook and dual-core probe allow different products cook at the same time.